Alaska’s Boardwalk Lodge proudly participates in the elite Orvis® Endorsed Fly Fishing Lodge Program — a distinction that demonstrates our commitment to excellence and ensures that this fly fishing adventure will exceed your expectations. As part of this select program, Boardwalk outfits you with complete top-of-the-line Orvis fly fishing equipment. Of course, we certainly won’t discourage you from bringing your time-tested favorite fly fishing gear with you. Note that all fly fishing equipment, including rods, reels, flies, waders, and boots are all part of your lodge package at no additional cost. July heats up with seasonal Coho and Sockeye Salmon runs. Pinks, or humpies, and Dog Salmon typically start their journey in August. The majority of these Salmon have never seen an artificial fly, much less taken one. Brace yourself when these trophy Salmon hit — the fight is non-stop, and the action is exhilarating! Coho Salmon, also known as Silvers, are among the hardest fighting Salmon in Alaska. Coho Salmon average between 12-15 pounds, with some topping out over 20. Intense fishing for Silvers ranges from late July through September. While Pinks are the smallest of Salmon, they are pervasive in area waters — so much so that guests often claim they can walk across them. Alaska Pink Salmon average 3-5 pounds and are a thrill to catch on the fly. Dog salmon, or Chums, are famous for their sheer tenacity and strength. 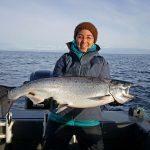 Excellent Chum Salmon fishing is common from mid-July through August. These Salmon average 15 pounds with an occasional lunker topping 25. Sockeyes, also called Red Salmon, can be rather tricky to catch in local waterways. Sockeyes are known for their tremendous fight. One of the beauties of Boardwalk’s spectacular oceanfront location is versatility… If you ever tire of fly fishing you can climb aboard one of the lodge’s 28-foot heated cabin cruisers. Saltwater fishing trips launch from the dock each day with our Coast Guard licensed captains. Early season action begins with one of Alaska’s most coveted game fish — wild Pacific Steelhead. These phenomenal fighters are native to the island, with typical trophy-class lunkers in the 29-37 inch range! 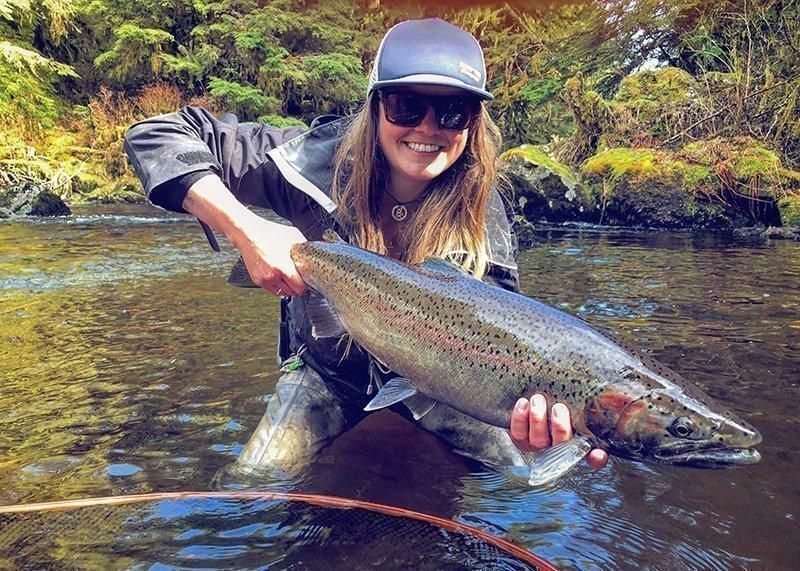 Pacific Steelhead are fierce fighters that can quickly fold your rod and take you into backing. The lodge accommodates Steelhead fishermen from May 1 through May 31. Space is limited on Steelhead runs so be sure to book your trip early to ensure best reservations. Year-round excitement abounds with the Cutthroat and Dollies in nearby waters. Local lakes, rivers and streams are teaming with Trout and Char. These fish are generally from 10-21 inches, and there’s certainly no shortage of action… Trout and Char are so plentiful, you can often catch and release to exhaustion!